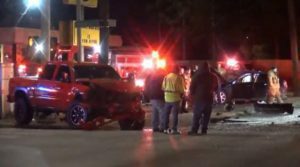 Houston (January 20, 2019) – A drunk driver is facing two charges after a two-car collision that injured four people in southeast Houston. The crash occurred at 7500 Harrisburg around 1:15 a.m. on Sunday, January 20, 2019. According to a witness, Isreal Suarez Lugo was driving a red GMC Sierra pickup truck heading westbound and weaving between lanes on Harrisburg. The driver of a black Cadillac CTS was traveling northbound on South 75th Street heading towards the intersection of Harrisburg and had a green light. The witness stated Mr. Lugo accelerated and ran the red light colliding with the Cadillac at the intersection. The driver of the Cadillac was transported to Methodist Hospital. A 15-year-old male passenger in the Cadillac was taken to Texas Children’s Hospital. A 24-year-old female passenger was taken to the hospital in critical condition. A 5-year-old girl passenger was taken to Texas Children’s Hospital in critical condition. The latest reports indicate the girl had surgery for a traumatic brain injury and is fighting for her life. Mrs. Lugo, a passenger in the truck, suffered minor injuries and was treated at the scene and released. Mr. Lugo was arrested at the scene. He was charged with two counts of intoxication assault in the 339th State District Court. Authorities are still investigating surveillance footage at the accident location. Time Out #1 Sportsbar on Fuqua may face charges due to overserving Mr. Lugo. If you or a loved one were involved in a car accident, it is important to contact a legal accident expert to help you evaluate your options. Call (713) 987-7111 or send us an email to discuss your car accident injury case.